At this critical time for action on climate change, Richard Gower, Tearfund’s Senior Economics and Policy Associate, explores how the circular economy can play a big part in a low-carbon future. It’s been a momentous but mixed two weeks for the climate and clean energy agenda. At the beginning of the month, the Paris Agreement – a global compact negotiated in December 2015 – came into force, following much faster ratification by the world’s big players than anyone dared hope. Then a few days later, the US elected a man who has threatened to pull out of the agreement and reverse Obama’s Clean Power Plan to reduce emissions (thankfully, the US has already ratified the Paris Agreement and can’t pull out for four years). As climate negotiators meet in Marrakech this week, here’s another piece of good news: there is an as-yet untapped opportunity to help us dramatically speed up the transition to a zero-carbon world – the circular economy. This is about changing the way we design, buy and use products to make the most of the materials they are made of. At the moment we make a product – say a toaster or phone – it doesn’t last long and when it breaks, or there’s a better model available, we throw it away and all the resources used to make it (metals, energy, water) are lost. Recent research suggests that half of the remaining climate emissions gap could be closed by being less wasteful in our use of materials. Under business as usual, the world is headed for a global temperature increase of more than four degrees by 2100. 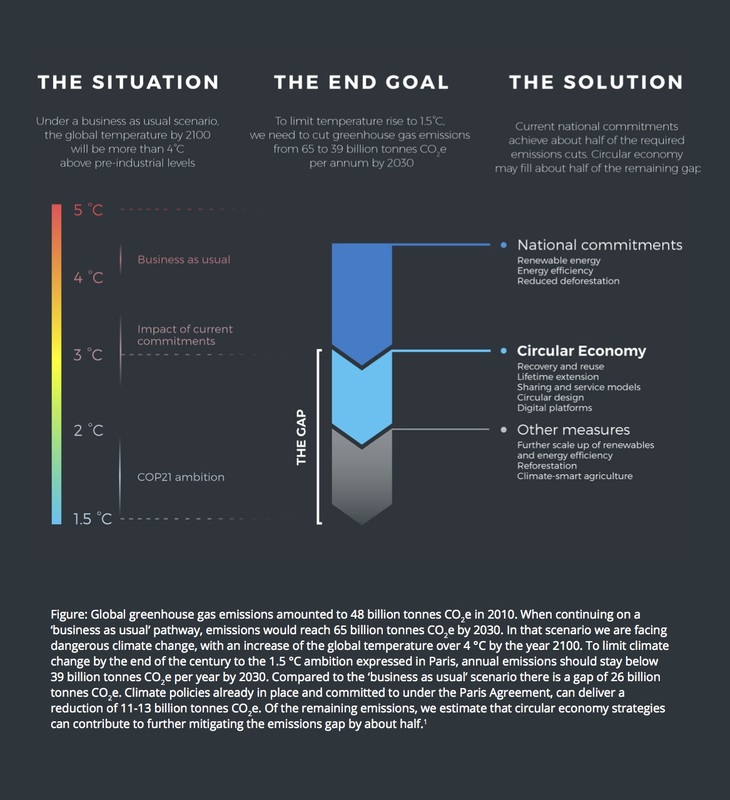 Existing commitments under the Paris Agreement take us around half-way to the target of 1.5 degrees. The circular economy could close half the remaining gap. Each year, we extract roughly 60 billion tonnes of raw materials from the natural world. Most of our global emissions are associated with digging them out of the ground and turning them into things that we can use. Keeping your mobile phone in use for an extra year cuts its lifetime CO2 impact by a third. In 2015, a single car sharing platform in Seattle reduced the number of vehicle miles travelled by 34 million. Making clothes last a year longer cuts their lifetime CO2 impact by a quarter. Recycling aluminium requires 95% less energy than producing the metal from scratch. Even improving basic waste management in emerging and developing countries could make a big difference. In Brazil, half of collected waste is organic, and this breaks down in landfill to produce methane, a greenhouse gas 20 times as powerful as carbon dioxide. Sending this waste for composting instead results in a big carbon saving and also creates jobs. For this reason, Kenya has made improving waste management a significant part of its plan for reducing carbon emissions. At present, close to two thirds of Nairobi’s waste sits in informal dump sites or is burned, and less than 10% is recycled. Kenya’s plan would change this, and other countries could follow suit. All of these examples have two things in common: they are happening now, and the potential for scale-up is exciting. What’s more, most of these ‘circular economy’ strategies do not feature in countries’ existing climate plans. Rolling them out more widely could take us a big step closer towards meeting the Paris Agreement’s 1.5 degree target. Find out more about Tearfund’s research and going circular in Brazil, Ghana and India by reading our recent report Virtuous Circle: How the circular economy can create jobs and save lives in low and middle income countries.